The Custom Monogram Shoppe is the industry leader in creating products to help your business look its best. We transform our clients’ corporate visions into beautifully designed, embroidered, monogrammed, and screen-printed items for businesses, organizations, civic groups and teams, and more. We take pride in every item we create knowing the finished product plays an important role in how your business puts its best foot forward. When you work with the Custom Monogram Shoppe, your experience will include customer service that is second to none. Our design consultants and sales team work with you on every aspect of the process – from start to finish – to ensure you have the design you love on the product that best fits your need and your budget. Located in the heart of Long Island, NY, The Custom Monogram Shoppe has been serving customers throughout the United States since 1976. 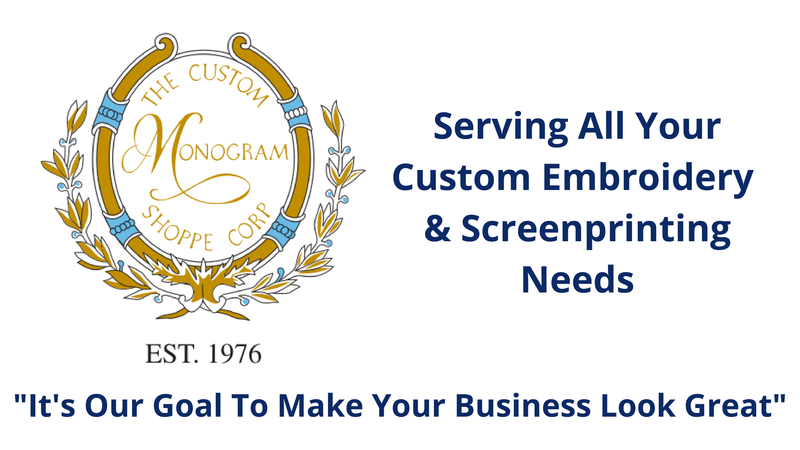 Owned and operated by CEO and President, Jim Bassil, The Custom Monogram Shoppe is your first choice to make your business, organization or team look its best. Offering top of the line customer service, one-on-one design consultations, and immediate guidance from start to finish. Our impressive showroom is home to thousands of clothing, embroidered and screen-printed samples, giving you the option to experience what we do first hand. Too far to stop by the showroom? Not a problem – simply contact the email or number below to receive physical catalogues and a free quote on your order. Our goal – To make your business look great. We can positively convey your corporate image through high quality products that appeal to your business. Contact us today for a free catalog, including merchandise available for all orders. Share your company logo and we’ll provide a free price quote. No job is too big or too small. Whether you need 3 items, 300 items, or 3,000, the Custom Monogram Shoppe will get the job done right. Count on the industry leader to take the stress out of your experience. Check Out Our Embroidery Machines In Action!